Those who are fans of A Song of Ice and Fire probably already know this, but for those who don’t, two fans of the series started a blog a while back where they cook and catalog each and every dish mentioned in one of the books of A Song of Ice and Fire (and there are many). The blog is called The Inn at the Crossroads (named after the, uh…Inn at the Crossroads from the books), and it’s chock full of recipes both tasty and terrifying. But for those of us who have read as far as A Dance with Dragons, there’s one recipe that is bound to make one shudder: Honey Spiced Locusts. The locust is, of course, edible, but the very thought of eating an insect is…disquieting. I mean, with a snail, you can close your eyes and pretend it’s a clam or a shrimp, but a locust?! Ain’t no getting around that thorax. Blech! One day I reached into the Ghirardelli box to grab a handful of chocolate chips like I always did, and when I put them in my mouth, the first thing I thought was, “Ewww… There was a ball of hair in the chocolate chips for some reason.” Then I went to the sink and spit out ten to fifteen melty chocolate chips and…a dead cricket. The dude in the dining room thought this was funny—after all, what’s wrong with a cricket that isn’t wrong with beef or chicken or fish? And while I agree with the spirit of the rejoinder, I did not plan on putting a cricket into my mouth, and, if I’d been given the choice, would have chosen not to. Really and truly I would have. Thus endeth the tale of David’s mouth and the cricket. And if I have my druthers, no cricket will come as close to my esophagus as that cricket did that fateful afternoon ever again. 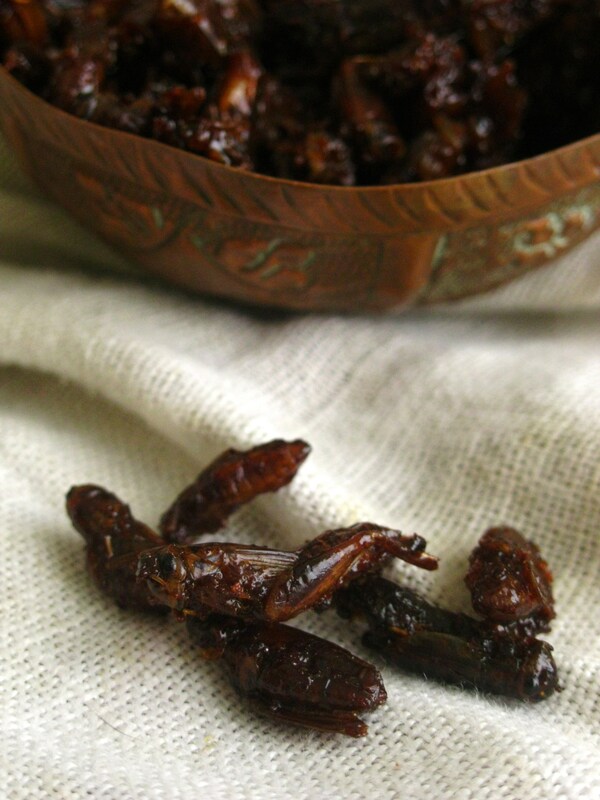 But by all means, if you feel like trying out the ol’ honey spiced locusts/crickets, give it a go! If you take a picture of yourself doing so, I’ll put it up here and give it a proper Dothraki caption of one kind or another. Posted on October 9, 2011, in Community, Vocabulary and tagged food, lol, misc. Bookmark the permalink. 12 Comments. I’m going to take a guess that chelsian is an animate noun. Would that be correct? Actually, it was inanimate, but since you suggested it, I decided to change it. So, yes, it is an animate noun. I love the idea of eating insects. If the culture would allow, they would be very favourable food group. Apart from an occasional ant (formic acid the local lil’ guys use as poison is delicious) I’m still on curious-but-haven’t-tried stage, but I trust ickiness factor would be quite surpassable. Crunchy would be easy, I think, caterpillars and maggots would be a tougher challenge. … [SPOILER warning] Izat would, I guess, be “to be poisonous”, but how would you say “to be poisoned”, any difference? And is there a difference between “to be poisonous” in a sense “to have a poisonous attack” and “to be poisonous” in a sense “to be poisonous if eaten”? I would guess the way you would say “to have a poisonous attack” in English would be with the word venomous instead. A venomous snake kills you if it bites you. A poisonous snake (there are a couple) kills you if you eat it. I didn’t get what you were saying at first, but now I get it. Your first question is simple enough: izat is “to be poisonous”; izzat (somewhat irregularly, perhaps—or perhaps by metaphorical extension) means “to poison” (started with animals, but has been extended to assassins, etc.). In order to say that someone is or has been poisoned, you just use the passive of izzat. Now, izat is actually intended to mean “to have a poisonous attack”. That was its original meaning (i.e. izat would be used to describe a scorpio or snake). This was extended to inanimate objects (here not Dothraki inanimate, but real life inanimate, like mushrooms or berries). So the idea is that if a mushroom is poisonous, it is thought to have a poisonous “attack”, in a sense. So, then, the two are, indeed, the same, but the latter derived from the former, and not the other way around. Hadaen nem izze ki mahrazhi. Please tell me that’s just an error. I thought we got the past tense right at the wiki now, and that’s plural verb conjugation according to our page. Right. My sentence was almost as simple as I could make it, though. Trying to use ..er.. relative clauses was pretty much the whole point. What I was originally wondering was, how to use “poisoned” as ..er.. an argument modifier – in the same role as “poisonous” or “venomous”. As in Don’t eat this poisoned food. After a bit of wikipediaing it seems that is a case of a reduced relative clause, but does Dothraki have such things? Oh, and when I say what I was originally wondering, I gotta admit, that wasn’t what I was originally asking, just what I was wondering and should have asked. Anyway, if you’re interested in relative clauses, I can probably just do a post on them. Be easier than trying to get all that into a comment. Closer to home than you might think! This is Japan’s イナゴの佃煮 (inago no tsukudani) or alternately イナゴ甘露煮 (inago kanroni). The latter is specifically honey/honeydew related. This 保存食 (hozon-shoku = ‘preserved food’) is common in the more northerly/colder prefectures of Japan (but specifically on Honshu) where it was traditionally not easy to maintain a good source of protein over the long, cold, snowy winters. They are quite tasty, but I have a 美的嫌悪 (biteki ken’o = ‘aesthetic aversion’) to the crunchiness and the pokey nature of the legs. If you really want to try some, here’s the recipe in Japanese. Have fun with Google Translate, or if you’re really serious about a genuine Westerosi experience, then let me know and I’ll translate it into Andahli for you. Wow! That’s pretty cool. I’m going to tip off The Inn at the Crossroads about this reply.